'The Nutcracker' With An Alaskan Twist In Sitka, the local production of The Nutrcracker is uniquely Alaskan. Father Herring replaces Mother Ginger; the Mosquito Queen reigns instead of the Mouse King. Father Herring performs with dancers during Sitka's Nutcracker ballet in Alaska. When Melinda McAdams moved to the fishing community of Sitka, Alaska, in 1993, no one in town knew how to dance on pointe shoes. Now, generations of dancers are up on their toes and every few years, they take the Tchaikovsky classic — The Nutcracker — and give it a rural Alaskan twist. This two-act ballet begins when a girl named Marie (Clara in many productions) is gifted a wooden doll at a Christmas party. After the clock strikes midnight, the Nutcracker, played by 18-year-old Kincaid Parsons, comes to life. "This is the moment I change from doll to man," Parsons says, as he motions to the Christmas tree from backstage in dress rehearsal. "It's quite an intricate scene. You've got the presents moving out. The curtain coming in. There's bad mosquitoes everywhere." Yes, mosquitoes — what some Alaskans call the state bird. 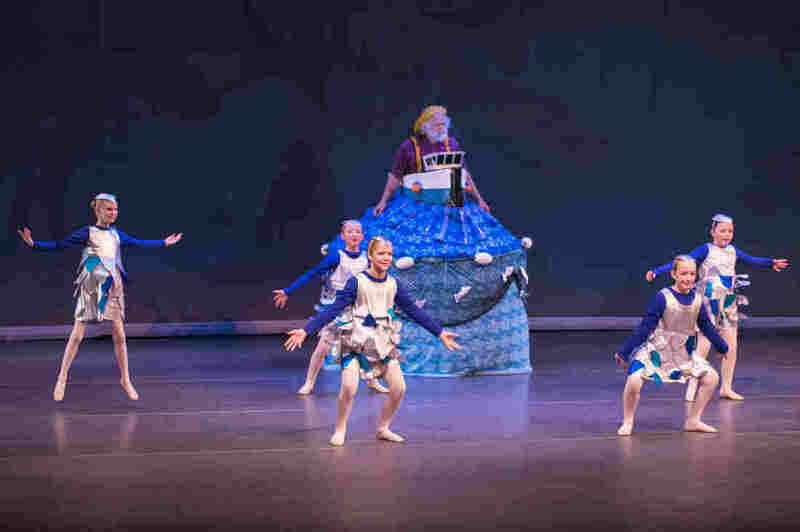 The Fireweed Dance Guild has staged The Nutcracker in Sitka every other year since 1998. Every few years, they set the plot against an Alaskan backdrop with characters the audience intimately recognizes. Instead of a Mouse King and his army of rodents, the Nutcracker goes to a battle with Mosquito Queen and her swarm. He's assisted by housemaids with fly swatters. A bald eagle soloist leaps among dancing pine trees. Another soloist grand jetés to evoke the Northern Lights. As the Nutcracker whisks Marie away to Alaska, they're entertained by jellyfish, can-can girls from the Klondike Gold Rush era and a waltz of the state flower, forget-me-nots. The audience chuckles at a gag involving cruise ship passengers, who visit Sitka by the hundreds each summer. A tap dance homage to a fish processing slime line wins loud applause. Many of these adaptations are the ingenuity of the director, Melinda McAdams. Sitka is the former capital of the Russian empire in North America and in adapting this Russian ballet for local audiences, she has no problem breaking with convention to make the material fresh. "I'm proud of the fact that the audience recognizes their lives in it," she says. "They're like, 'You should do the Spanish Dance with crabs because their little snapper hands will be like the castanets.' So we've done it that way ever since." McAdams has a shock of pink running through her gray hair and heaps of energy. She was pregnant with Parsons (the teenager playing the Nutcracker) in the first production. McAdams still keeps a drawing that Parsons made in kindergarten above her desk that says, "Dancing is double fun and so are you!" Luckily, both he and his sister Delaney McAdams have taken to ballet. In The Nutcracker: An Alaskan Tale, there's still a snow queen and pas de deux — with the fireweed fairy instead of the sugar plum fairy. But the biggest tutu of the night is worn by a crusty, old fisherman on stilts played by family physician Don Lehmann. Lehmann made a snap decision to take ballet classes in his 40s as he neared the summit of Denali, the highest peak in North America. "It came to me in a flash, between one step and the next," Lehmann says. Instead of Mother Ginger, Lehmann plays Father Herring. His torso is a fishing boat and his enormous hoop dress represents the blue ocean. Beneath that, the youngest dancers are dressed as herring and comically dodge his attempt to catch them. Herring are a forage fish that return to Sitka every spring to spawn. At 65, Lehmann has watched generations of these herring dancers grow into Nutcracker soloists and scene stealers. He gets emotional talking about it. "It's fun watching them grow," he says, near tears. "You can't believe how beautiful and graceful they are." Mounting The Nutcracker is a city-wide effort. Hundreds of volunteer hours went into sewing costumes, baking cookies and hauling sets for 81 performers in the show. Lehmann is confident when he says, "This has to be the best Nutcracker per capita anywhere."